It was so good to get all the windows open on the first cool morning after the heatwave and to feel a cool breeze blow through the house. However, that was not all that came in the window. I would have thought that the swallows would have chosen their nesting places and not still be looking over our living room as a potential new home. It has been so hot and dry that I was concerned a lot of the plants would suffer. The grass has dried up but we have left patches of cat’s ears for the bees. The willows (Salix alba “Chermesina”) in the middle of the picture provide a good screen for our sitting area and have kept green. On the right the Chitalpa has started flowering as has the Magnolia on the left of the willows. The Chitalpa is a cross between the Catalpa bignonioides (Indian bean tree) and Chilopsis linearis (Desert willow). It does well in the sun in this exposed position which does not get watered. My disappointment is that the flowers are not as visited by the bees as the Catalpa flowers but I prefer my Chitalpa as the Catalpa would grow too big for this spot. The Magnolia grandiflora does not seem to mind the heat and the lack of water. It is growing big now and the flowers are often high up but the perfume still floats down. We do water the vegetables and that has been a nightly task. The Borlotti beans have started to give pods and they will hopefully continue through the summer. There is no lack of pollinators for the courgettes and we have already had so many that we will probably have to remove some of the plants to avoid a glut. We water the flowers in the front garden and the Agapanthes are in flower just now. Everything looks happier after several days of really good rain. The first field of Sunflowers opened near us four days ago. The flowers had already been spotted by the bees and we wondered if our bees had found them too. A shot of the bees at the mouth of the hive confirms that the bees have been on the sunflowers as there are many bees covered with the tell-tale (tell-tail?) bright yellow pollen. We are happy too and take great pleasure in leaving the windows open while we have a cup of tea and watch the rain pour down. What funny creatures gardeners are! 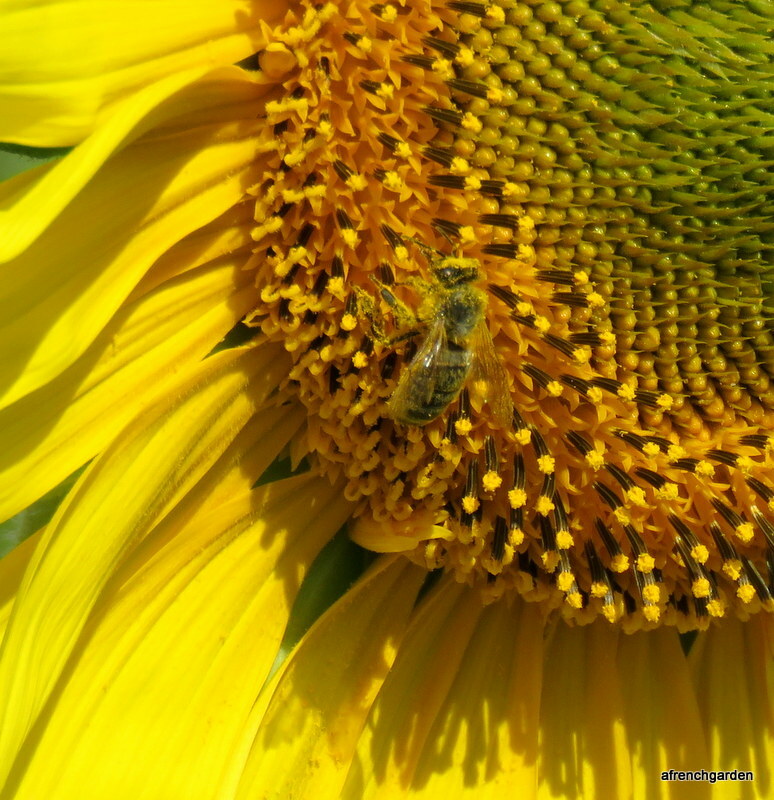 Categories: Garden | Tags: bees, Chitalpa, gardening, sunflowers | Permalink. What’s happened to the sunflowers? Earlier this summer when I started putting the supers onto two of my hives, our beekeeper friend, Michel, told me that once the sunflowers opened across the road from us, the honey bees would fill one super in just one week. Well, the sunflowers have certainly opened across the little road to our hamlet, only a few metres away from our four hives. So, during the warm mornings, Amelia and I eagerly went in search of the bees across the road. Amelia walked right through the field but only found a few bumble bees and there were very few honey bees on the sunflowers. What I have now discovered is that Michel was right and the honey bees did indeed collect loads of pollen and nectar from the sunflowers – however, the emphasis is on the past tense. The disc florets in the centre of sunflowers have both male and female parts and each female part has a single ovary that develops into a seed. It appears that the new varieties of seeds planted near us now are self fertilising type, thus eliminating the need for bees to fertilise the plant. More importantly, these new varieties have a much longer neck to the style and as the nectaries are situated just above the ovaries, this makes it difficult for the honey bees to collect the nectar. 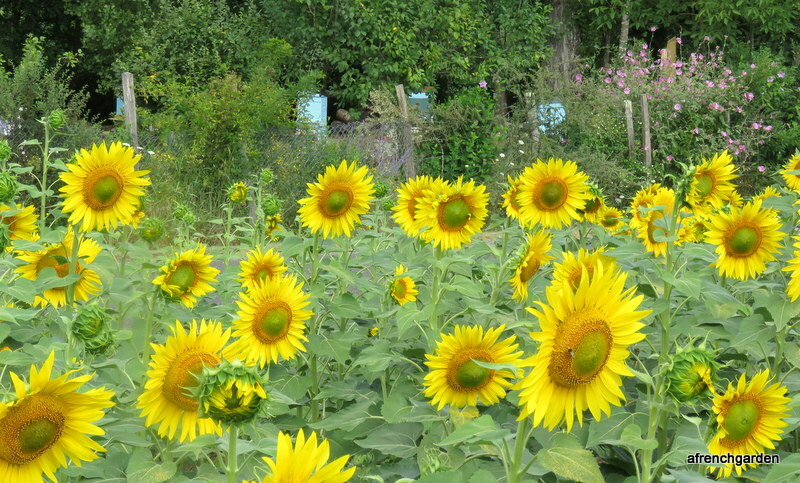 So, although the sunflower field does look very pretty across our land, it does very little good for our bees. On my visit next day, however, I did see a much pollen smothered bee homing in towards a sunflower. She did look so pretty and I was fascinated to watch her rolling the little reddish ball of pollen on her hind legs. I managed to take a short video clip of her. If you would like to see it, please click here. Nevertheless, we are lucky that there are a variety of flowers around us, as the supers we put on two of our hives look well on the way to being filled. Categories: Bees | Tags: bees, French life, gardening, honey bees, sunflowers | Permalink. This is a special time in the Charente- Maritime region. The sunflower fields are in full bloom. I look forward to the sunflower season in this area, as you drive around you can see acres of sunflower fields. It is a fairly flat region and you can see the yellow fields stretching off to the horizon to meet up with the blue sky. The main crop is still the grape vines but the grape vines are overshadowed by the display of sunflowers just now. There is a small sunflower field, nestled in between the vines, just 200 metres from the house and I decided to keep a record of it flowering. 27th. July The sunflowers are not turning to face the sun! The sunflower, Helianthus annuus, or tournesol in French, turns towards the sun. Well, sort of, they had me fooled. Seemingly they do follow the sun as they are growing and while the shoots are flexible enough. However, once they are in flower their stiff stems are too inflexible to continue the motion and the heads point towards the rising sun. Certainly mine turned their backs on the setting sun and are facing a constant SE. Categories: flowers | Tags: flowers, France, nature, photographs, sunflowers | Permalink.